Llanbedrog accommodation - high quality holiday homes and cottages in Llanbedrog, holiday home Llanbedrog, Llanbedrog cottage rental, Llanbedrog accommodation, pet friendly cottages Llanbedrog. Abersoch accommodation - high quality holiday homes and cottages in Abersoch, holiday home Abersoch, Abersoch cottage rental, Abersoch accommodation, pet friendly cottages Abersoch. Pwllheli accommodation - high quality holiday homes and cottages in Pwllheli, holiday home Pwllheli, Pwllheli cottage rental, Pwllheli accommodation, pet friendly cottages Pwllheli. If you are looking for "Llanbedrog accommodation - high quality holiday homes and cottages in Llanbedrog, holiday home Llanbedrog, Llanbedrog cottage rental, Llanbedrog accommodation, pet friendly cottages in Llanbedrog", then this is the page for you. If accessing a web site from the table below - each link will be opened in a new window for you. Some of the establishments listed are pet friendly, bedrooms range from studio, 1 bedroom, 2 bedrooms, 3 bedrooms all the way up to 6 bedrooms - so please visit their web site for details. 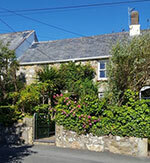 A four bedroom cottage recently renovated and is on two floors. There are two ground floor bedrooms - a main bedroom which has a king size double bed, clock radio, the second bedroom has twin single beds; the other two bedroom are on the first floor and both have three single beds. The upstairs bedrooms share a shower/bathroom room and the downstairs bedrooms have a shared wet room shower. There is an open plan living area with a multi fuel buring Clearview stove, settees, dining table and 10 chairs, colour digital LCD Full HD flat screen 32" television with freeview and DVD player, radio. The lounge opens onto a conservatory complete with fan. There is a separate fully equipped kitchen including dishwasher, microwave, 7 burner gas hob range with two electric ovens, American style fridge/freezer with chilled water/ice dispenser, washing machine and condensing dryer. 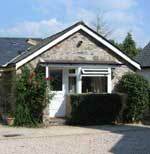 The whole cottage has a pressured hot water system and oil fired central heating. At the front there is a private tarmaced drive and parking and the cottage is in its own ground overlooking fields. No hidden extras all linen, towels, electricity, heating, gas, tea towels, oven gloves, washing up liquid, soap, toilet rolls etc included, plus a welcome pack of bread, butter, milk, eggs, tea, coffee and sugar! One of the few cottages locally that has free Wi-Fi, free ample off street parking, pet friendly, family friendly, no hidden extras, linen included, welcome pack included, cards accepted, open all year, owner operated, no agencies, friendly - flexible - why choose anywhere else! A three-bedroom cottage with exposed beams. The main bedroom has a double bed, clock radio and en-suite shower room, the second bedroom has twin single beds, clock radio and hairdryer and the third two sets of bunk beds. These share a separate shower room. There is an open plan living area with a 3 piece suite, dining table and 8 chairs, colour television, video and DVD player, radio, electric fire, electric central heating and a fully equipped kitchen including dishwasher, microwave, electric cooker and fridge. At the rear there is a small fenced in patio overlooking the fields and Rival Mountains, with plastic table and chairs and a gas BBQ. No hidden extras all linen, towels, electricity, heating, gas, tea towels, oven gloves, washing up liquid, soap, toilet rolls etc included, plus a welcome pack of bread, butter, milk, eggs, tea, coffee and sugar! A three-bedroom cottage with exposed beams. The main bedroom has a double bed, clock radio, hairdryer and en-suite basin and toilet, the second bedroom has a bunk bed and the third a single bed. There is a separate shower room. There is a living area with a 3 piece suite, dining table and 5 chairs, colour television, video and DVD player, radio, electric fire, electric central heating and a fully equipped kitchen including dishwasher, microwave, electric cooker and fridge/freezer. At the rear there is a small fenced in patio overlooking main walled garden, with plastic table and chairs and a gas BBQ. No hidden extras all linen, towels, electricity, heating, gas, tea towels, oven gloves, washing up liquid, soap, toilet rolls etc included, plus a welcome pack of bread, butter, milk, eggs, tea, coffee and sugar! A one-bedroom cottage with exposed beams. The bedroom has a double bed, clock radio, hairdryer and en-suite shower room. There is an open plan living area with the additional sleeping arrangements of either a full size double futon sofa bed with deluxe mattress or 2 single futon bed chairs with deluxe mattresses. Also include is a colour television, video and DVD player, radio, electric fire, electric central heating and a fully equipped kitchen including microwave, electric cooker and fridge. At the rear there is a small fenced in patio overlooking the fields and Rival Mountains, with plastic table and chairs and a charcoal BBQ. No hidden extras all linen, towels, electricity, heating, gas, tea towels, oven gloves, washing up liquid, soap, toilet rolls etc included, plus a welcome pack of bread, butter, milk, eggs, tea, coffee and sugar! A studio cottage consisting of an open plan living area with full size double futon sofa bed with deluxe mattress and a separate shower room. There is a colour television with video and DVD player, clock radio, hairdryer, old-fashioned radio, pot bellied stove, electric central heating and a fully equipped kitchen including microwave, electric cooker and fridge. At the side there is a small patio, with table and chairs overlooking the fields, and a small charcoal BBQ. Ideal for a couple.No hidden extras all linen, towels, electricity, heating, gas, tea towels, oven gloves, washing up liquid, soap, toilet rolls etc included, plus a welcome pack of bread, butter, milk, eggs, tea, coffee and sugar! “The house in the valley where the stream flows”. The house is situated on the main Abersoch Road and is approached via a long driveway, passing ponds, a putting green, lined with mature trees encompassing a 150 yard front garden. The stream runs along the wall and meanders its ways from one pond onto the next before it finds its way to the sea. Glynllifon is a luxury 6 double bedroom house, with a spacious lounge, another large open plan lounge/dining, a bar and a games area which can accommodate up to 13 people. The house is currently being totally refurbished to a very high and comfortable standard and will be ready for occupation for short weekly to monthly lets from Saturday 7 May 2011. Accommodation cvonsists of 4 double bedrooms and 2 single bedrooms, one of these is the attic area ideal for children. One large bathroom with a whirlpool making a total of 4 bath/shower rooms. There is ample parking space for the odd car or boat. Glynllifon is available to rent to families only. 'Ty Iago' is a beautifully presented, spacious detached house situated in the picturesque village of Lower Llanbedrog. The beach (National Trust) and Wales Coastal Path are on your doorstep and the local pub/restaurant, supermarket, gallery and cafes are all just a few minutes walk. A beach hut is provided from around mid-April to September. 6 Bedrooms. Bedroom 1: Double bed with en-suite shower room. Bedroom 2: Double bed with en-suite shower room. Bedroom 3: Twin with en-suite shower (no wc). Bedroom 4: Twin on mezzanine. Bedroom 5: Twin. Bedroom 6: Double with en-suite shower room (ground floor). 5 Bathrooms. Bathroom 1: En-suite with shower, basin and WC. Bathroom 2: En-suite with shower, basin and WC. Bathroom 3: En-suite with shower and basin, no WC. Bathroom 4: En-suite shower, basin and WC, Bathroom 5: Family Bathroom with bath, shower, WC and basin. The cottage is situated on Henllys Ganol farm in rural North West Wales, on the Llyn Peninsula. Ideally located at the gateway to the most stunning and unspoilt part of the Llyn Peninsula. Conveniently situated in Llanbedrog - a stone's throw from the vibrant village of Abersoch and the seaside town of Pwllheli. TWO self-catering static caravans. Fantastic views over the Rival Mountains and Cardigan Bay. A very friendly site. A former farm house in an elevated position outside the village of Llanbedrog, 3 miles from Abersoch, 1 mile from the pub and 1.5 mile from a sandy beach. Three double bedrooms (all double beds), Two bathrooms, Kitchen/dining and a double bed settee providing extra sleeping accommodation if required. Free WIFI, all bedding is supplied (bring your own towels), electricity is included. This property is available Friday to Friday throughout July and August. A secluded farmhouse, near Abersoch, overlooking Cardigan Bay. Sleeps a maximum of 4. Sorry no children under seven and no pets. Accommodation: Lounge with colour television, fully fitted Kitchen with gas cooker, extractor hood, microwave, washing machine and fridge/freezer and dining area, Bathroom and 3 Bedrooms (consisting of 2 double bedrooms and a single bedroom). We also offer - Henllys Newydd Self Catering Static Caravan - which has a spacious living area with lounge, dining area and kitchen. There is a double bedroom and a twin bedroom which would be ideal for children. The bathroom has a large shower cubical and wash basin, and there is a separate toilet. Crugan Farm, is a Grade 11 listed farmhouse on a mixed working farm. It is a traditional welsh farmhouse tastefully modernised but unspoilt, retaining all Olde-worlde charm. There are two double bedroom and two single rooms, Bathroom with shower downstairs, Lounge with colour TV and video, Dining room and a well equipped kitchen including a microwave, fridge/freezer, automatic washing machine and dishwasher. A cot and highchair are available. All linen and towels are provided. All Electricity is included. 2 BEACHFRONT PROPERTIES AVAILABLE - The 1 Bed Cottage sleeps up to 4 people and the 3 Bed Cottage sleeps up to 8 people. Spectacular beachfront cottages in an unrivalled seaside position. These self catering holiday homes really do combine the perfect boathouse combination of beachfront living with all the benefits of the Area of Outstanding Natural Beauty designation which applies to the entire area in which the holiday cottages are situated. Due to the owners recent purchase the accommodation is available to rent at extremely short notice. Songbird Hideaway - A COZY CABIN - with sweeping sea & Snowdonia views. Madryn Lodge offers character self catering accommodation in a very rural setting, with far reaching views of mountains and sea, from the cottage and the lovely secluded cottage garden. Suitable for small family groups exploring the beaches and coves to friends looking to spend a few days exploring the Abersoch Mountain bike tracks and outdoor actives. The property is nestled in the pretty little coastal village of Llanbedrog, situated along a quiet lane with views down towards Llanbedrog's headland to the sea. It offers accommodation and facilities for families and couples only, and is ideal for beach, walking or just relaxing holidays and week-end breaks. It is double glazed and comprises lounge including open coal fire, double patio doors, BT Infinity with BT Sports and TV; CD player/Radio/ipod station. A separate dining area is next to the kitchen with dishwasher, oven/grill/hob, microwave and fridge/freezer. A bathroom with shower above the bath, toilet and cabinet washbasin. The two bedrooms are a double room and a bunk room with spacious 3′ bunks. There's also the pharmacy nearby. Small pets welcome. Price range £300 - £500 per week. The accommodation has parking for 2 cars, and comprises: Lounge including T.V, DVD player and CD player, Radio. Dining area. Kitchen including dishwasher, oven, grill, hob, microwave and fridge/freezer. NEW Bathroom with shower above the bath, toilet and washbasin. Two Bedrooms (one is a double bedroom and the other has 2 x 3' single beds). Only a 10 minute walk takes you to the superb beach with cafe, restaurant, beach huts and woodland walks to the Tin Man on the top of Llanbedrog headland. The ice cream stall at the cafe by the beach will delight both young and the young at heart while the brave and fit can dig and swim until the sun sets and later. For those who like to dine out, a five minute walk will take you to the Glyn-Y-Weddw pub or walk 5 minutes the other way to another pub in the village The Ship Inn another direction 5 minutes to the excellent restaurant at Tremfan Hall. There is also a Spar supermarket 5 minutes away which is open early until 6pm most of the year. A group of like minded owners sharing bookings between themselves. On this website you'll find details of quality Self Catering and Bed & Breakfast Farm holiday accommodation on the Llyn Peninsula, close to Abersoch, Aberdaron, Criccieth, Llanbedrog, Nefyn, Pwllheli, and Porthmadog. Book direct with the owner - No agents and no booking fees. Winners of the Wales Tourist Board 2005 Catering Award. A complex of cottages, with indoor pool; gym; tennis court; play room with soft play area; cycles; trampoline; and other activities. Your comfort is our concern, and all cottages are 4 or 5 star with all inclusive rental - no hidden charges. Take a short break in the low season to investigate this Organic Farm on the Lleyn Peninsula, an Environmentally Sensitive Area, 20 miles West of Snowdon. Pensarn Farm is a working farm with beef cattle, situated in a quiet rural area on the outskirts of Pwllheli. The owners make available a wing of the Farmhouse from the beginning of May to the end of September only, as a self catering Holiday Cottage, which sleeps 6 in two double rooms and a bunk room. Set in the rural countryside yet only 2.5 miles from Pwllheli. Llwyn Beuno, Efailnewydd is a working farm and ideal base for touring Lleyn and Snowdonia. The owners make available a wing of the house for holiday lets. Sleeps 5 - Bed 1: Single bed, Bed 2: Double + single and Bed 3: Double. Within easy reach of sandy beaches, coastal paths and rolling hills, just 10 minutes from PWLLHELI MARINA, we'll even accommodate your boat. Hafod Heulog is especially well appointed and in an elevated position in a quiet cul-de-sac less than 1 mile form Pwllheli town centre, golf course, beach and marina. Sleeps up to 8 people, with off street parking for two cars and a garage for storage. Relax with Phil & Meinir and our children on our traditionally run family farm in the picturesque village of Llangian, one and a half miles away from the well known water sport centre of Abersoch on the Llyn Peninsula, North Wales. All the family speak Welsh as our first language. Rectory Cottage is the rear wing of The Old Rectory. Set in its own private sun-trap garden offering 2 bedroom, 2 bathroom accommodation for a relaxing self-catering holiday. It is safe for children who are welcome to use the paddocks to play in. There is ample parking space at the front of the main house for boats etc. and storage for cycles in a lock-up garage. A separate laundry room at the rear of the cottage has a washing machine and tumble dryer. A BBQ and garden furniture is provided. Large Lounge/Diner (with 42” LCD T.V., flagstone flooring, beautiful leather suites, fantastic art-work adorning the walls; dining table/chairs; French-Door access to the private patio area). Kitchen (fully-equipped to include a Belfast sink unit, microwave, electric oven, fridge with ice-box), Shower Room (with walk-in shower, toilet and washbasin). Gallery Bedroom (with a LUXURY HYPNOS DOUBLE MATTRESS – you won’t believe how comfortable this bed is – you won’t want to get up in the morning!). Price includes oil-fired central heating and electricity - no pets. Rhos Country Cottages are not barn conversions on one large complex, but are detached, individual and traditional, stone built Welsh farmhouses and country properties; each enjoying its very own idyllic grounds with very private secluded gardens (but not isolated) on our 200 acre of farmland which runs down to the River Dwyfach, where some double bank fishing can be done. Being rated 4 & 5 STAR accommodations by VISIT WALES they are open all year and are always warm and inviting with Off Season Short Breaks available from November through to March. The cottages offer "Olde Worlde Charm & Character", with old oak beams, ingle-nook fireplace with real log fires, antiques and lovely country furnishings. With every ‘home from home’ comforts of 4 & 5 Star accommodation; some even have a Four Poster Bed, own Snooker Room, own Private Sauna, or own Jacuzzi Bath. Our mission is to provide a holiday that will remain as one of your most treasured memories. Our objectives are to provide 21st century standards and expectations at our Farm Spa complex whilst continuing to provide our natural Welsh Welcome. In order to achieve this we offer eco friendly and green accommodation and provide the highest standard of luxury in all cottages. We maintain the exceptional standards of in-house cleanliness and encourage guests to resource food locally. We have 5 self catering cottages on the complex which can accommodate groups of 2, 3, 4, 6 & 7. We are offering a superb, mid terrace, four bedroom house. Recently renovated to a very high standard which sleeps 8 with rear, enclosed garden. 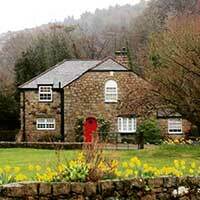 Established in 1970, we are one of the oldest independent cottage holiday agencies in Northwest Wales. We are a small agency, who believes in a no-nonsense, friendly, and personal approach to business. Our reputation for fairness and openness is such that we have built a loyal following of hirers who return to our cottages year after year......in fact, over 65% of them return! Visit their web site to see what's on offer.